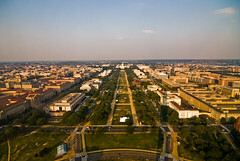 Kiplinger’s has named DC the 3rd Best City in 2009, just behind #2 Albuquerque and #1 Huntsville (really guys? Huh?). It all comes down to job growth, income growth and housing, it seems. With the government here, and with all the associated business related to the government, we’re picking up jobs, and picking up stimulus funding and growth. Hey don’t knock my home state – Huntsville is pretty booming with tech and aerospace engineering. Not to mention that the Huntsville area is gorgeous.